You know, every year I intend to make Christmas cards. And every year I leave it until it's too late. What makes this scenario more frustrating is that I am actually a Moo designer, so it really is an opportunity going to waste. But whilst it's on my mind, I was thinking that perhaps, maybe, I could get some Christmassy drawings together now. So by next year I'd be really really prepared. There'd be no excuses. Next year I'll be the kid who doesn't leave their homework until half an hour before it should be handed in. I was never that kid. I was the one doing my homework on the school bus. On the way to school. Times they are a changing. I like to think. I'm calling this one Everyday Matters challenge #95. Draw a holiday card. More challenges HERE. Cute. If you'd drawn another 3 it could have been the Twelve Days of Christmas! I can so relate to that. But wow--love the greens in these beauties! Love me some sprouts! Especially these. Who loves to eat brussel sprouts? Not when they're overcooked in water! Need to be crunchy and almost barbequed. Well, if you can draw these, then I can happily drew parts of our lush vegie garden such as the Oriental spinach we ate tomight - stir-fried with noodles etc. These sprouts have real personality! I'm curious, though, about sprouts as a holiday card? 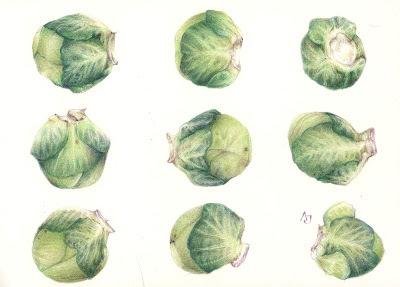 I'm not that keen on Brussel sprouts, but I love your drawing ! I did not know about Brussel Sprouts as a Christmas tradition in the UK - learn something new every day! I don't really care for them, but yours are lovely. I could see them as a fresh new replacement for the tired old poinsettia designs which abound this time of year! love the drawing but sprouts for Christmas? Weird! But I guess no weirder than string bean cassarole here in the states. Our must haves are cranberry sauce (homemade!) turkey, and pecan pie! Revelle don't forget the candied yams. I love these sprouts but don't like the real ones. Too bitter. Nice sprouts lady! I put mine on to boil back in August, they should be nice and crisp by Christmas day. I'm cooking for fourteen, so three pan loads should about do it. Do they freeze? Love this design, I really wish I had thought of it!!! I love sprouts... I can't understand why people don't like them! Amazing amazing drawing! Bloody ell. I actually was thrown out of the country for not eating brussels sprouts at xmas dinner. That's why i live in america. They ask me at customs if i intend to eat sprouts on my visit and i lie and say yes. But i can't stand them. Too much christmas day gas, shall we say. Aw, now i'm feeling nostalgic and want to eat them to feel british again. Revelle, I hardly think that's fair. We get sprouts you get pecan pie. Christie, that's exactly what I'm trying to avoid. Stepehen, thanks for the reminder. must get that pan on. Pete, I did wonder about you actually. My ex used to have one on the plate - just so he wasn't thrown out of the country, of course - and he'd eat it first so that he could 'enjoy' the rest of his dinner. So there we go - have one! Thanks, guys. I kinda like them. Sprouts, that is. Oh, okay and, the drawing. Beautiful! I loves the Brussels sprouts, I do. Unshakably Christmas (I don't have any until Christmas to save them up), along with roast parsnips, bread sauce (I adore bread sauce) and trifle! Oh yes, and chocolate for breakfast. Well, I must admit to not knowing (or not remembering) this brussel sprouty Christmas tradition. As much as I know and love alot of Brit things, and have visited in the past a number of times, this is not on my list of experiences. Of course, I have never been in the UK at Chrsitmas, more's the pity! P.S. did you get my recent thank you email? Wanted to make sure you knew I was thrilled with the moos!! I love it! Can you sell it as some postcards? I'm sure it would sell any time of year! i love your art. your spouts looked like fishes. i am so glad i found you!